SolidWorks 2014 has a new feature that tracks changes to your part and assembly files. This tip shows you how to use and customize it. When you open a part or assembly for the first time in SolidWorks 2014 or if you open a new file your History folder will be empty. Make a few changes, and then expand the folder. The History folder shows the items you’ve changed with your most recent change. This not only allows you to see the history of your changes you can edit the item right from the History folder. By default the list will grow until 10 items have been modified, and then the oldest items will fall off the list. So the maximum length of the list is 10. You can change this setting by right clicking the History folder and selecting History Options. Now you can set the length of the list to any length you prefer. 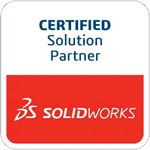 You can also improve your productivity with SolidWorks by watching our courses.